아마디야(아랍어: أحمدية, 우르두어: احمدِیہ), 아마디 교단은 19세기 말 즈음에 영국령 인도에서 탄생한 이슬람의 개혁파이다. 마지막 때의 세상 개혁자에 대한 예언 성취를 주장한 미르자 굴람 아마드 (1835년 ~ 1908년)의 생활과 교리가 그 기원이다. 그는 14세기 이슬람력의 무자디드, 곧 이슬람교가 기다려온 약속된 메시아이자 마흐디임을 주장하였다. ↑ Valentine, Simon (2008). 《Islam and the Ahmadiyya jamaʻat: history, belief, practice》. Columbia University Press. xv쪽. ISBN 978-0-231-70094-8. ↑ Morgan, Diane (2009). 《Essential Islam: a comprehensive guide to belief and practice》. Greenwood Press. 242쪽. ISBN 978-0-313-36025-1. ↑ Naeem Osman Memon (1994). 《An Enemy a Disbeliever a Liar, Claims of Hadhrat Ahmad》. Islam International Publications. ISBN 1-85372-552-8. ↑ B.A Rafiq (1978). 《Truth about Ahmadiyyat, Reflection of all the Prohets》. London Mosque. ISBN 0-85525-013-5. 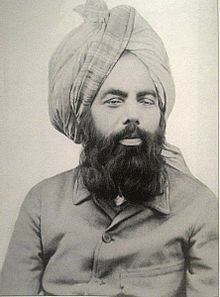 ↑ Mirza Tahir Ahmad (1998). 《Revelation Rationality Knowledge and Truth, Future of Revelation》. Islam International Publications. ISBN 1-85372-640-0. 이 문서는 2018년 10월 2일 (화) 14:31에 마지막으로 편집되었습니다.